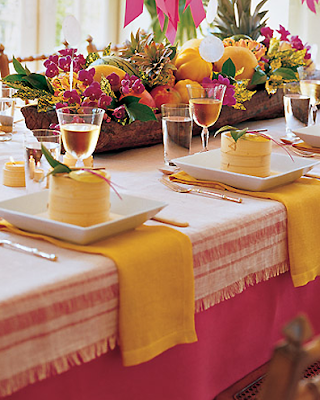 The holidays are in full force and for many of you, that means entertaining and playing hostess. Preparing to host a dinner party and/or having house guests during the holidays often forces us look at our home in a different light...one that magnifies all of the imperfections, the clutter, the dust, the outdated decor, and so on. Most people I know (myself included) feel the need give their home a small decorating pick-me-up before having a bunch of guests over...especially if they haven't seen your house in a while. Here are 10 simple ways to give your home a mini makeover in a snap! What other suggestions do you have to spruce up your decor quickly? Please share your thoughts! 1. Accent Pillows - revive your sofa by switching out existing pillows with new ones or by re-covering old pillows with new pillow covers. It will do wonders! 2. Freshen up the guest bedroom with new linens and organize accessories and guest necessities on a decorative tray, which can be placed on a vanity, console table or nightstand. 3. 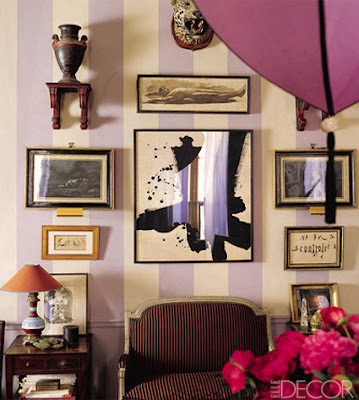 Re-hang existing artwork by grouping together interesting pieces with 3-dimensional objects (shelves, carvings, etc.). Scour your entire home for random pieces of wall decor that can be grouped together to make one beautiful statement wall! 4. Asses the need for additional lighting in darker rooms. 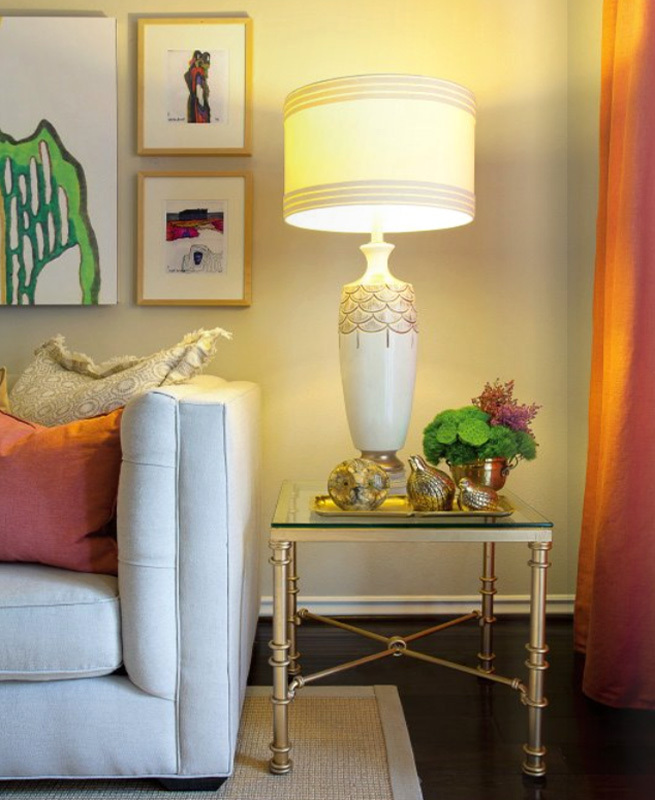 Add an eclectic table lamp or floor lamp to brighten up a space that feels dim and depressing. 5. Re-organize an overcrowded bookcase or cluttered shleving. Arrange books both upright and stacked on their side. Mix in accessories of various shapes and sizes to add interest and color. 6. De-clutter countertops, tables and flat surfaces - think, less is more. Re-accessorize and organize with decorative trays to keep things looking tidy. 7. 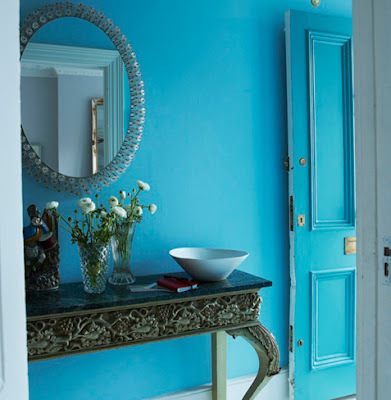 Nothing changes the look and feel of a space more than paint! 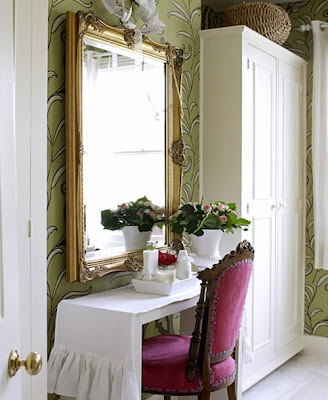 It doesn't have to be a major project - just paint a single accent wall in the dining room, entry, bedroom, etc. for an instant make-over. 8. New table linens - rejuvenate your kitchen nook or dining room with a fresh new tablecloth and linen napkins. Choose something with color or a subtle pattern. 9. Change up your decor with a new accent rug. Create your own with the affordable carpet tiles from Flor (approx. $12.99 per 20" x 20" tile). 10. I believe every home should have a vase of fresh flowers at all times. 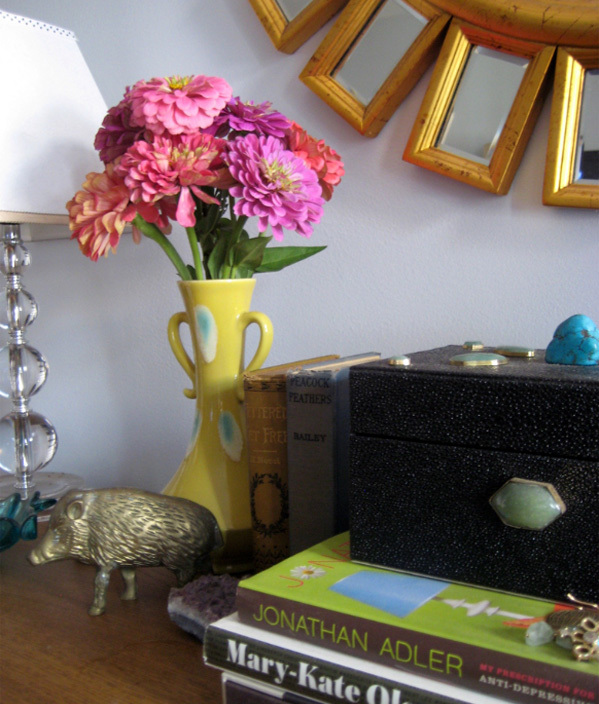 Flowers do wonders for a space - big arrangement or small - they add color and life! thanks so much. just decided to have a party but HATE my furniture and there is no time (or money) to update before the holiday soiree. but these tips are definitely do-able! Loving this post!!!!!! All of the photos and ideas are fantastic. 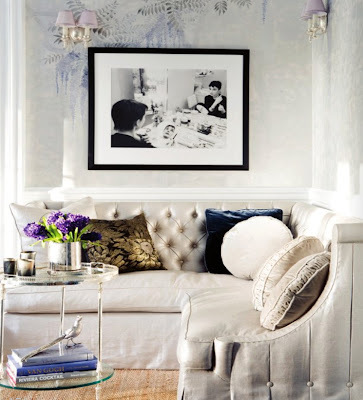 I definitely will be adding new throw pillows to my couch for the holiday season, thanks for the tip! Thanks for the great ideas! I'm going to pick up fresh flowers on the way home. thanks for helping me spread a little more holiday cheer! Great tips!!! I'm going to add this to my next link post on my own blog! Great tips and beautiful photos- especially love that last one with the boxing gloves. hmmm ... you pretty much summed up my own advice to friends and clients perfectly. and #4 is advice I need to take for my own office!